I will be teaching an eight week course about Queen Marie Antoinette and the French Revolution at the University of Toronto School of Continuing Studies on Tuesdays in March-April 2019. Click here for more information and to register. More than 200 years after her execution, Queen Marie Antoinette is still one of the most famous and controversial figures in European history. 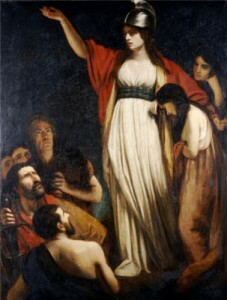 In late 18th-century France, her reputation influenced debates about the role of women in politics, their families and the arts. Austrian-born, her position at the top of French society fuelled criticism of the monarchy and contributed to the outbreak of the French Revolution in 1789. Her influence on popular culture continues today. Discover the real Queen Marie Antoinette behind centuries of myths in popular culture. Trace the reasons for her controversial reputation. Explore the clashes in the politics, culture and society of royal and revolutionary France. Look behind the legend and examine the controversial queen’s impact on politics, culture and society. 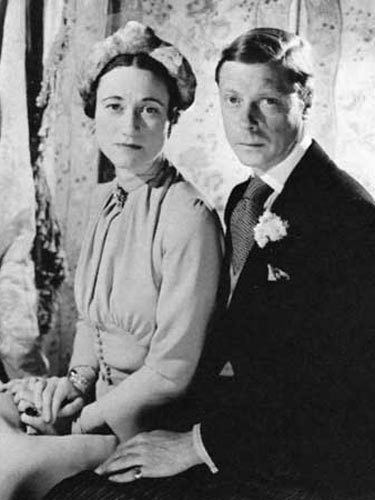 The Duke and Duchess of Windsor at the time of their wedding in 1937. My latest article in the BBC History Magazine is about unconventional royal wedding dresses from Marie Antoinette to Sarah Ferguson, Duchess of York. I discuss how wedding dresses at first considered unique or noteworthy set trends for future royal brides or contributed to the history of fashion. In honour of the wedding of Prince Harry and Meghan Markle this weekend, my feature article in the BBC History Magazine is about the 8 most famous royal weddings in British history. 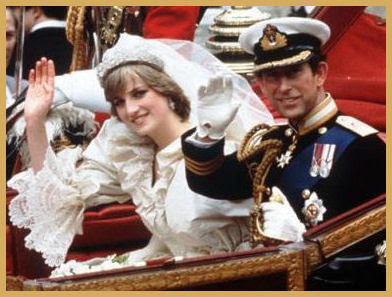 I discuss what each bride wore on her wedding day, guest list complications, wedding cakes and the variety of popular responses to royal weddings over the centuries from Tudor times to today. I am pleased to announce that my 2nd book, Queenship and Revolution in Early Modern Europe: Henrietta Maria and Marie Antoinette is now available in paperback for $39.99 and as an e-book for $29.99. Queen Marie Antoinette, wife of King Louis XVI of France and Queen Henrietta Maria, wife of King Charles I of England were two of the most notorious queens in European history. They both faced accusations that they had transgressed social, gender and regional norms, and attempted to defend themselves against negative reactions to their behavior. Each queen engaged with the debates of her time concerning the place of women within their families, religion, politics, the public sphere and court culture and attempted to counter criticism of her foreign origins and political influence. 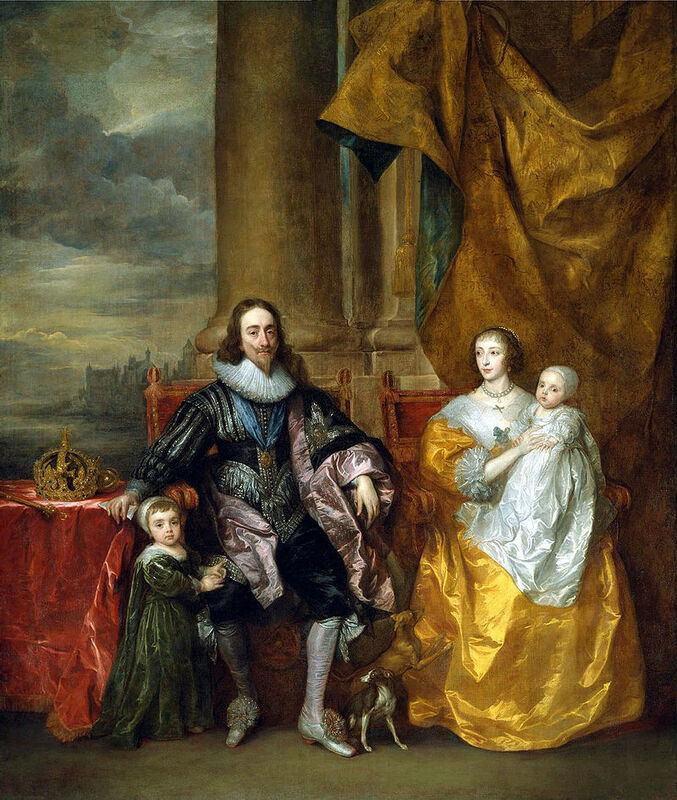 The impeachment of Henrietta Maria in 1643 and trial and execution of Marie Antoinette in 1793 were also trials of monarchical government that shaped the English Civil Wars and French Revolution. 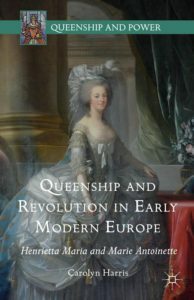 Click here to order Queenship and Revolution in Early Modern Europe: Henrietta Maria and Marie Antoinette from Palgrave History. On Wednesday afternoons in January and February 2018, I will be teaching an eight week history course about Family Life from Medieval to Modern Times. Our views on marriage and childrearing would seem very strange to families of past centuries. We’ll see the influence of romanticism on the current understanding of family life, the changing role of grandparents in relation to family traditions, and the emergence of a distinct children’s culture including the birth of children’s literature, due in part to the expansion of formal education. Join us for a look at marriage and parenting customs and advice through the centuries, and the surprising influence of history on family life today. Discover the impact of politics, religion and popular culture on family life over the centuries. Trace changes in the definition of the ideal marriage and family over time. Learn about the role of women within the family from medieval times to the present day. Measure the influence of religious leaders, philosophers and royalty on marriage and parenting trends. 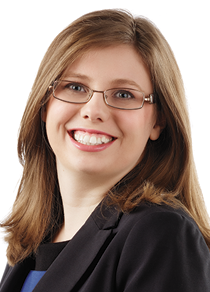 Realize how historical trends continue to influence family life today. Powerful women have presented themselves as warrior queens, rulers by divine right, wives and mothers and, most recently, as elected officials. We’ll examine the most significant female political figures in history, including Boadicea, Queen Isabella, Queen Elizabeth I, Indira Gandhi, Margaret Thatcher and Hillary Clinton. Through lively lectures and discussions, you’ll learn the story of women in political life. Why are women still underrepresented in political life? Join Carolyn Harris for a fascinating look at the often-neglected place of women in power from Cleopatra to Angela Merkel. Survey changing attitudes toward women and political power throughout history. Explore how female leaders have presented themselves to the public. Understand how powerful women are portrayed in popular culture and the media. Compare the experiences of female leaders around the world. See how the history of women in power influences female political leadership today. 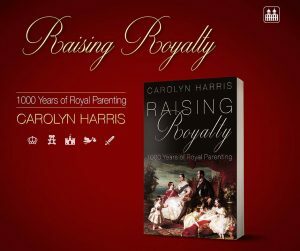 September 14, 7pm: I will be giving a reading from my new book, Raising Royalty: 1000 Years of Royal Parenting at The Box of Delight’s Bookshop in Wolfville, Nova Scotia. Book signing to follow. More information available here. September 15, 2:30pm: I will be giving a lecture about my 2nd book, Queenship and Revolution in Early Modern Europe: Henrietta Maria and Marie Antoinette for the Early Modern Studies Program at the University of King’s College in Halifax. Signed copies of all three of my books will be available for purchase. Click here for more information. September 16, 12pm: I will be participating in the Word on Street Halifax festival, giving a presentation about my 3rd book, Raising Royalty: 1000 Years of Royal Parenting at the Halifax Central Library. Book signing to follow. The full schedule for the festival is available here. My latest feature article for Canada’s History Magazine is entitled “The Queen’s Land: The colourful stories behind the royal names embedded in Canada’s geography.” I discuss the royal personages who gave their names to Canada’s cities and landscapes, revealing the fascinating historical figures behind Canadian places such as Annapolis Royal, Nova Scotia; Fredericton, New Brunswick; Prince Edward Island; Lake Louise, Alberta; and Prince George, British Columbia. The August-September issue of Canada’s History Magazine will be available on newsstands in the coming weeks.